We can safely say that Google Pixel 3 deals are the gift that can't stop giving right now. First came an unbeatable contract with cheap monthly costs, then John Lewis slashed prices on SIM-free Pixel 3s. And now the same never knowingly undersold retailer has followed up, cutting the price on the larger Google Pixel 3 XL as well. 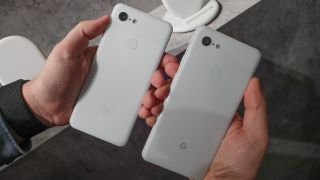 Offering both the Google Pixel 3 and its bigger brother, the Pixel 3 XL at prices well below the next nearest retailer, John Lewis has these device locked down. With the Pixel 3 coming in at £489 and the Pixel 3 XL costing £619, both of these discounts undercut the phone's RRPs by £250. Buying either of these devices and pairing them with a cheap SIM only deal could even get you a price cheaper than what's currently available on contract. That's an impressive feat considering just how cheap contracts on these phone now are. Ready to get the cheapest SIM-free price on the Google Pixel 3? You can find out all the details below but...you will want to hurry, these kind of deals don't tend to hang around long and will likely be gone very soon. Costing £230 less than the next nearest retailer, this is an incredible saving on one of the best phones on the market right now. With its award winning camera you'll be taking snaps like a professional photographer. Combine this with the device's impressive processor and you have a top of the line device. want to get the bigger, better model? John Lewis also has the Google Pixel 3 XL SIM-free for £619 - £100 cheaper than the next nearest retailer. Along with this top camera, the Google Pixel is also filled with Google smarts, a strong processor and powerful front facing speakers. At this price you won't find a better smartphone.